Here’s a fun and modern way to invite the holiday season into your home. 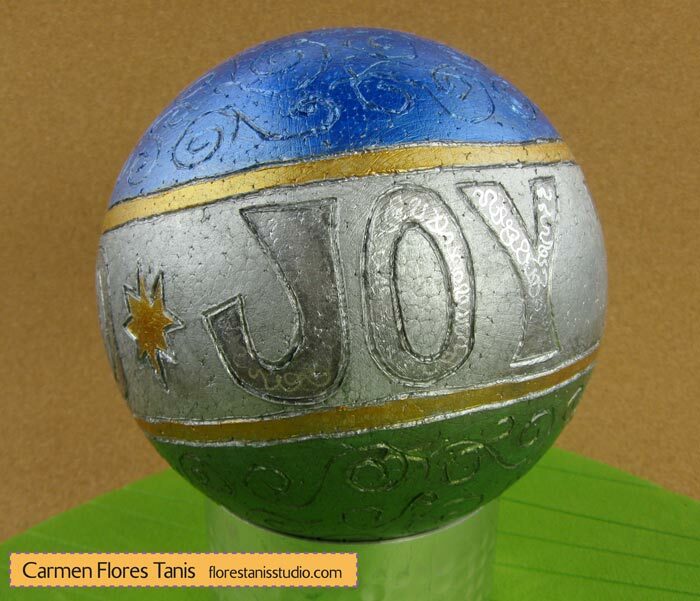 I carved the words “JOY TO THE WORLD” around a Smoothfoam ball and then painted it with metallic paints. I used a 6″ ball, but you can use a larger size and make a really dramatic centerpiece. I love this piece so much that I think that I just might leave it on display year round! 1. Sand the seam of the Smoothfoam ball as needed to smooth out. Wipe away the dust with a damp paper towel. 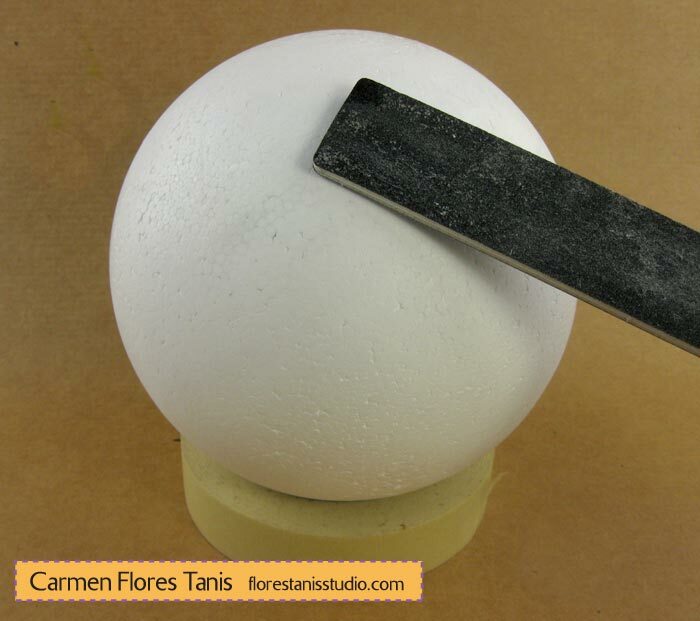 TIP: Place the ball on top of a roll of masking tape to keep it steady while you work. 2. 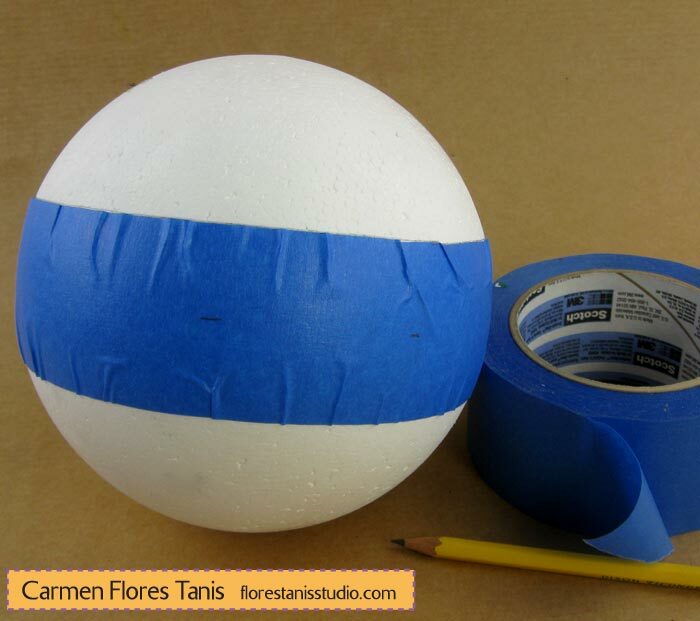 Wrap a strip of blue painter’s tape around the center of the ball being careful to align it to the seam line. This will help you to draw a nice even stripe around the ball. 3. Trace the edges of the tape with a pencil. Draw a second line 1/4″ outside each of the two drawn lines to make a nice border. Remove the tape. 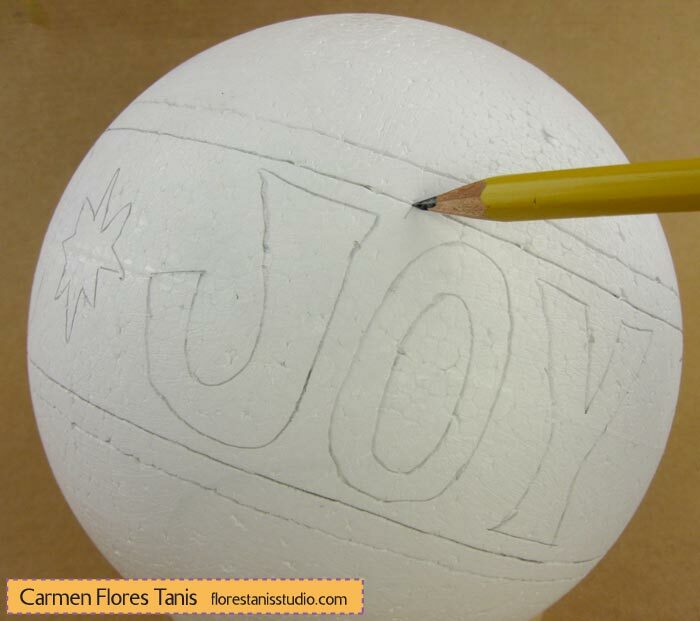 Write the words “Joy to the World” in the wide area in between the lines. You can use stencils too if you prefer. 4. 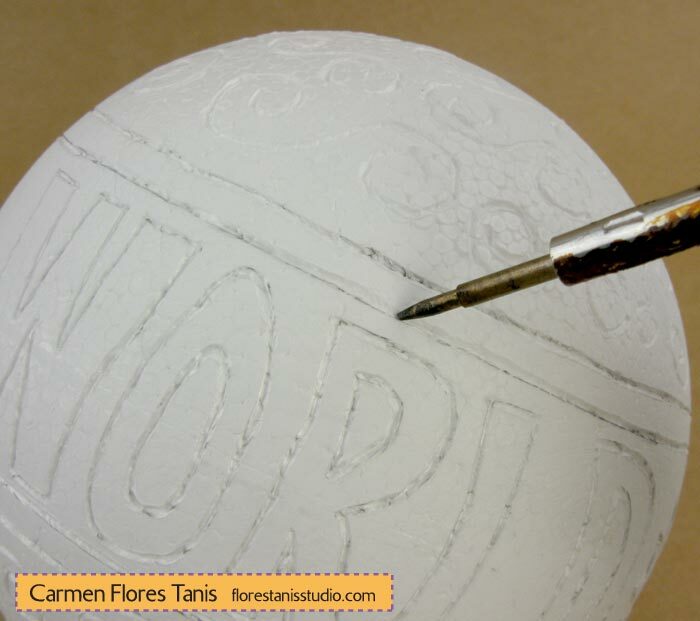 Use the heat carving tool to engrave the wording and other details as shown into the foam. 5. 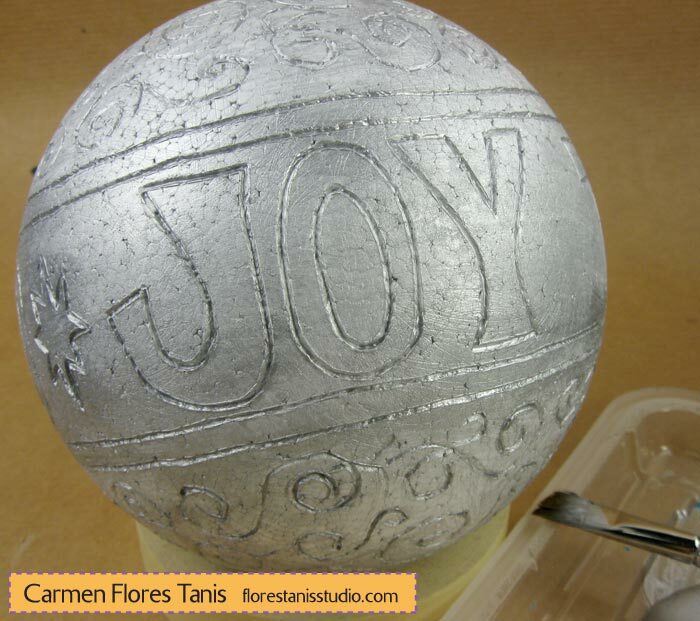 Paint the ball with silver paint. Let dry. 6. Continue painting the ball as shown adding the blue and green paint. Let dry. 7. Working in sections, brush on dark silver metallic paint and then quickly wipe it away with a paper towel. Paint will remain in the crevices and give you a nice antiqued effect. Brush each of the letters with dark silver paint. 8. 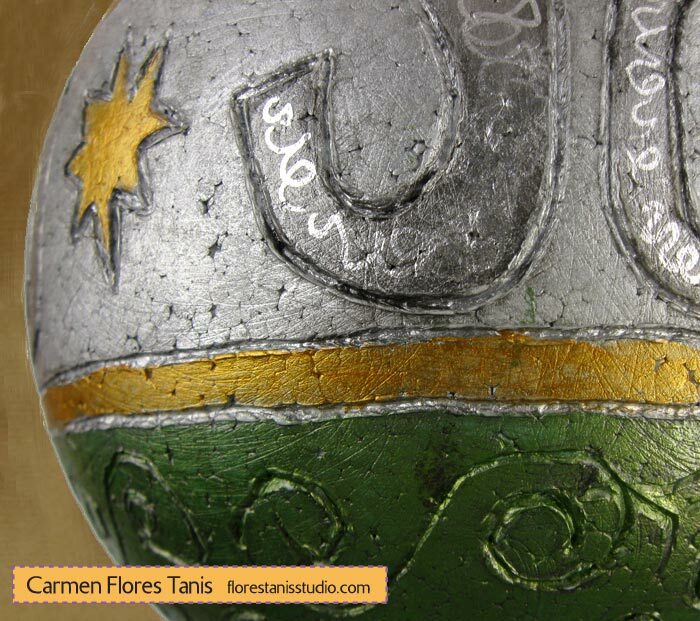 Brush gold paint onto the narrow stripes and the star. Scribble on each letter with the silver paint pen to add additional detailing. 9. Brush on a coat of clear acrylic sealer for shine and protection. Let dry. 10. Display the ball by placing it on the short can or small bowl. 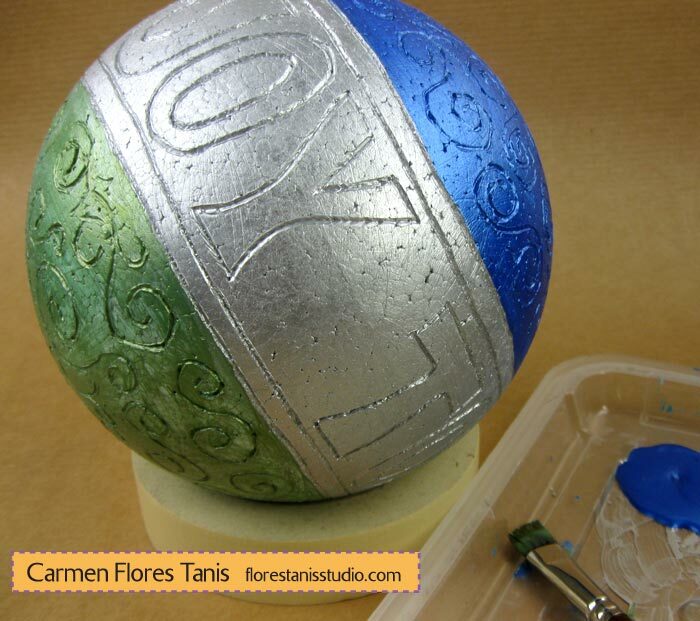 This entry was posted in Holiday Crafts, Special Techniques and tagged Ball, Christmas, Metallic, Ornaments by Carmen Flores Tanis. Bookmark the permalink.